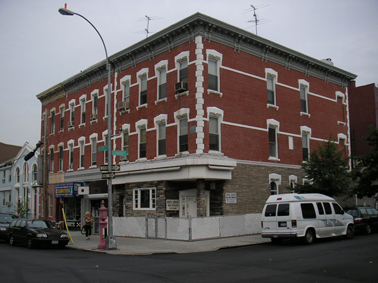 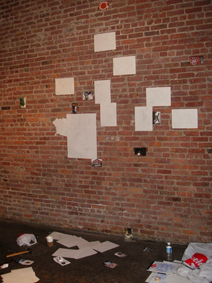 Several of the drawings which had previously been a part of the cluster of images surrounding the cut-out drawing of the rehearsal space on the inner eastern wall were removed: the drawing of the figure playing instruments in an apartment, the drawing of a figure listening to records, the cluster of drawings of buildings around the pool park. 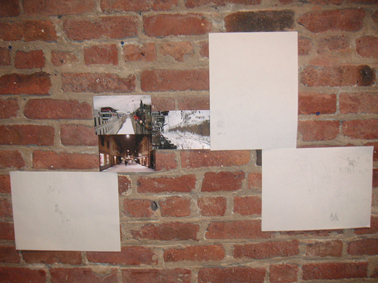 The photographs of the snow-covered streets, the drawing of a figure walking with a band above his head, and the drawing of a figure walking with the word balloon "Boys don't cry" were all rearranged on the wall. 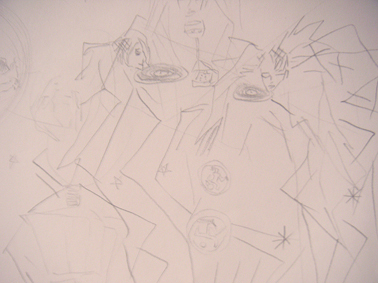 Added to these was a drawing of two figures talking outside of a building, within which could be seen a band performing on a stage. 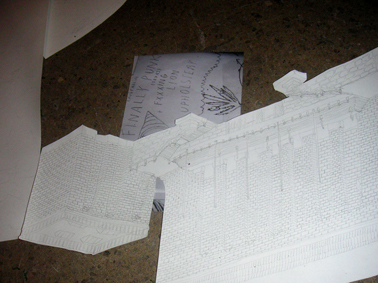 The cluster of drawings of the pool park and the buildings were placed on the floor. 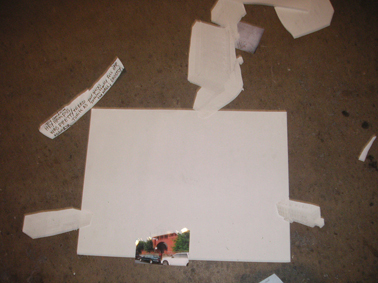 Added to this cluster was a photograph of a band flyer containing an "anarchy" sign. 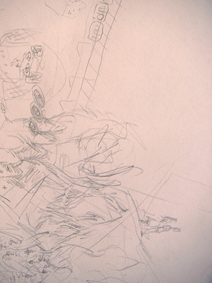 The cut-out drawing of a figure playing instruments in an apartment was placed on the western wall above the drawing of some figures in a bar. 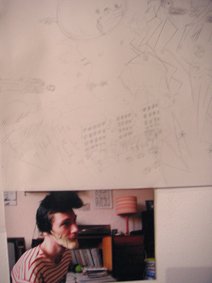 A new drawing depicting three heads in the sky above a group of three buildings was placed above the photograph of a person in a Morrissey-mask. 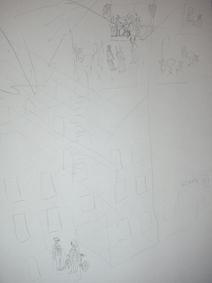 Three new figures were drawn on the cut-out drawing of a house with a person sitting in a kitchen. 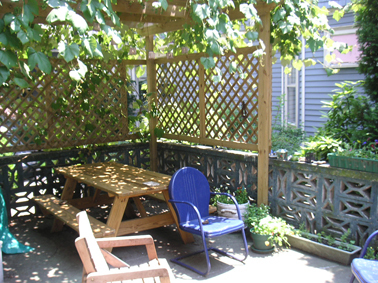 These three figures could be seen eating a meal on the outside patio surrounded by grapevines. 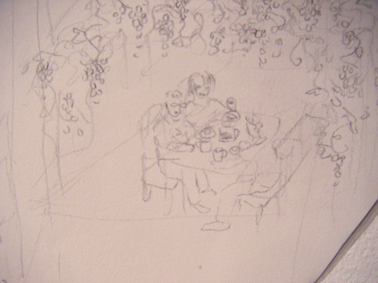 On the right side of this drawing a photograph of a patio surrounded by grapevines was placed. 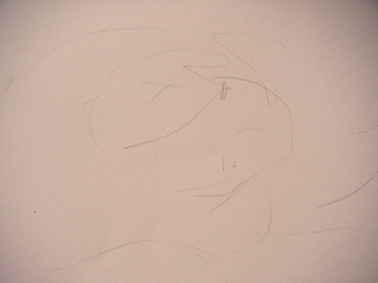 Above this photograph a drawing of some heads and figures surrounded by jagged lines/forms and lightning bolts striking buildings was placed. 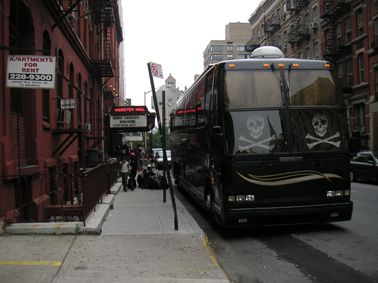 Right above this drawing a photograph was placed, depicting a tour bus with pirate flags in the front windows next to a concert venue with the words "Boredoms" and "Lightning Bolt" on the marquee. 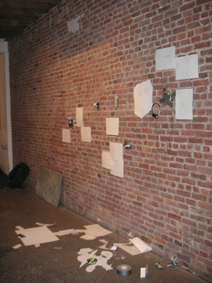 Underneath the cut-out drawing of the house a drawing of a vaguely sketched head and a coffee-cup was attached to the wall. 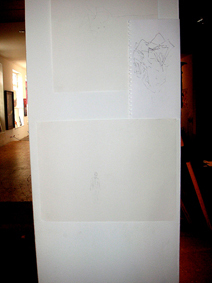 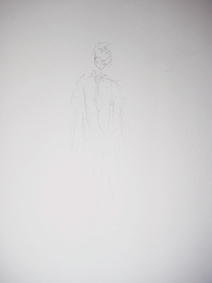 A drawing of a figure was added to the cluster of drawings on the edge of the wall dividing the gallery space. 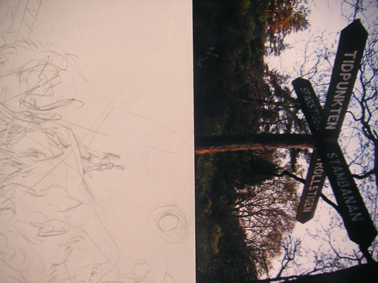 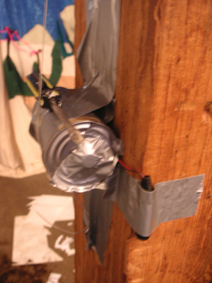 The drawing of a figure in a record store was placed on the outer eastern wall underneath the photograph of a mailbox with the words "echo" graffitied on it, and next to the cut-out drawing of a figure in a vaguely sketched landscape. 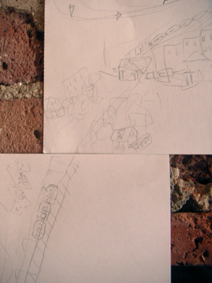 Underneath the record store drawing a photograph of a building was placed. 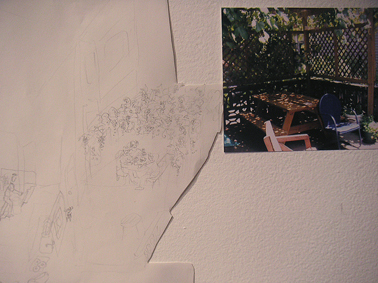 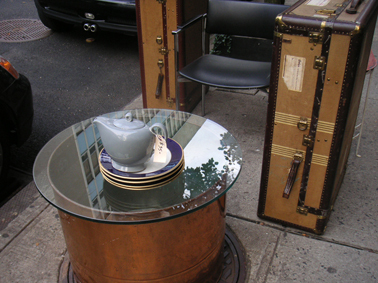 Above the drawing a photograph of a teapot on a glass table standing on a sidewalk, and the drawing of the interior of a cafe (with a band playing) were hung. 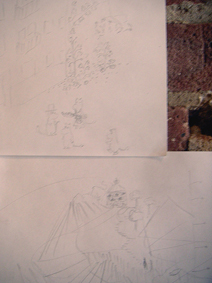 Above the drawing depicting some buildings, a forest, the planet Saturn and some anarchy signs, another drawing was placed -this one depicted two persons in an apartment building with Moomin-troll figures standing outside on the ground below. 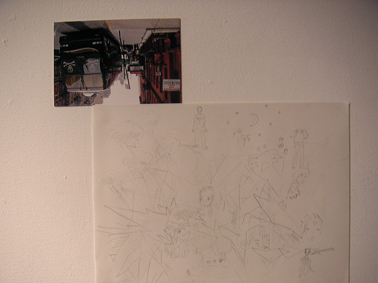 To the right of these drawings, two other drawings and a photograph were placed. 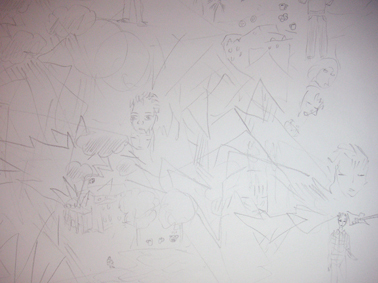 On the drawings could be seen heads and figures in landscapes of jagged lines, buildings, subway/tram-lines and stars, with a chalice, a raincloud (with a lightning bolt coming out of it), a sun and a moon (with a telephone attached to it) also depicted. 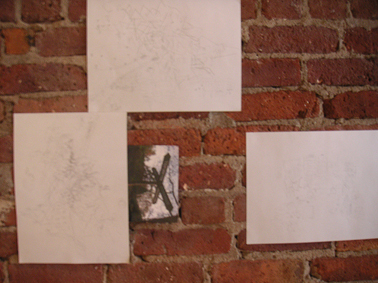 The photograph next to these drawings was of a signpost pointing to four different places: "Tidpunkten", "Spårstigen", "Stambanan" and "Trollstigen". 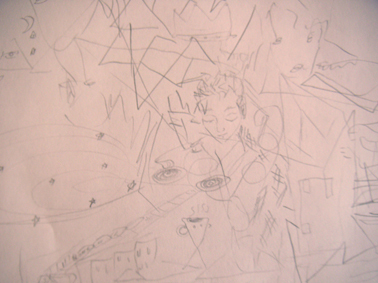 Above this cluster of images a drawing of a cafe with four figures, a bathtub, a moon, some stars and, at the very top, a sleeping figure, was placed. 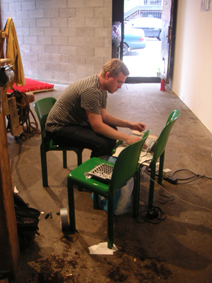 A concert was performed in the gallery by Hampus Pettersson and Dan Lundberg (collectively known as Elsewhere Right Now), with Hampus playing on the instruments which had been built there. 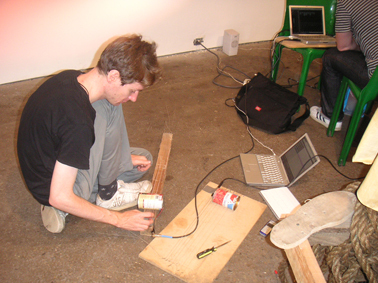 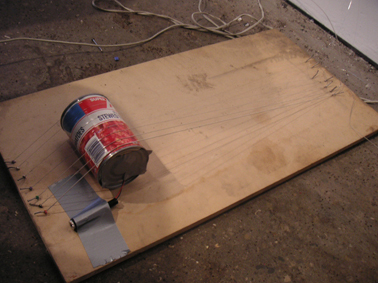 Contact microphones were attached to the instruments, which were plugged into a laptop computer where Dan processed, looped, and live-mixed them. 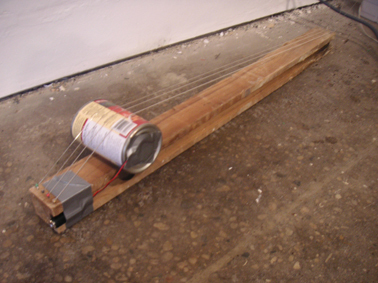 The piece ended with a vocal chorus performed by Hampus Pettersson and Liz Cummins over the electronic loops.